Oh hello! Yes, It is a busy week. 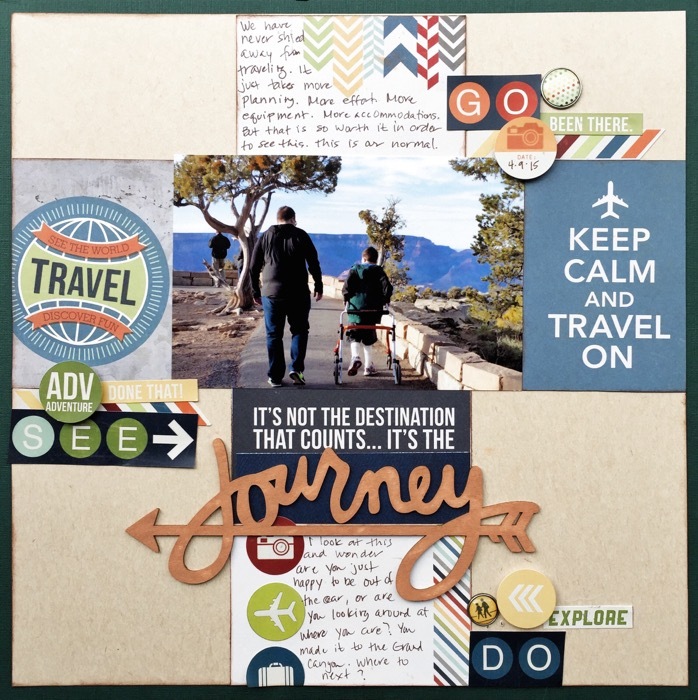 Today's project is featured in the newest Get It Scrapped article, Scrapbooking a challenging aspect of your life. I was surprised to have received this assignment, But, at the same time, I know that it was given to me because I do this regularly. I don't gloss over the hard stuff. My scrapbooks aren't all happy-go-lucky. I treat our challenges as everyday occurrences. It is my normal. We don't shy away from activities because of these challenges, we we work around them, so our family can have wonderful experiences. I share my challenges in a way that is uplifting. I share the accomplishments, but also the struggles that occur to get there. That is exactly what this photo represents. This photo is the end result of all the planning it takes for our family to go on vacation. Specific flight times, Family friendly hotels, Wheelchair friendly activities. The extra effort makes it possible for these moments to happen. We were all able enjoy the incredible beauty of the Grand Canyon. I really wasn't sure if I wanted to use travel themed papers or something more generic where I could add embellishments to help with the story. 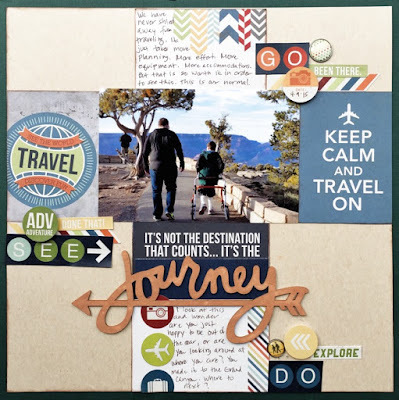 As I was looking through my supplies, I came across this travel line by Simple Stories. In particular, the 3x4 cards, especially ones with sentiments on them. The cards I chose all lean towards the challenging aspect of traveling, and to how we feel when we travel. I decided on a simple design. The cards surrounding the photo help tell the story, as well as move the reader around the page. The large wood word 'Journey sealed the deal for me. I covered up the rest of the sentiment on that 3x4 card and used that instead. It not only becomes the title of the page, but a focal point grounding the photo. Thanks so much for stopping by my creative view today. My team mates created some wonderful projects for this article. Be sure to check them out as well. Great layout, Devra. I love the story and the sentiments and, of course, the photo. You definitely have a can-do attitude when it comes to things...I wish I had more of that in me.